Shortly before 9 am, we packed our things in a taxi ordered by Yapeco. We´re going by taxi all the 370 kilometers to Matadi. The taxi ride will cost $120, and we´re also going to pay for food and accomodations in Kimpese for the driver. Our chauffeur is called Luamba Kinigela Sakoul and is a nice man in his fourties, but he can explode when fellow road-users don´t behave as expected. Then he rolls down the car window and shouts something that we don´t understand. He certainly is speeding, but with judgement. 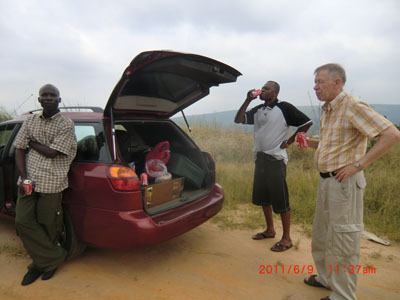 We stopped a few miles outside Kinshasa to have the breakfast we´d purchased before we left the city. On the meny was bread with cheese, Coca Cola and fruit. About thirty school children in white shirts and darkblue trousers passed us on their way to school. There were only two girls in the group. The rest of the girls were probably at home, working. It´s such a loss for the country not to give everyone the opportunity to go to school. We´d bought too much bread, but Yapeco cut a slice into two and offered it to some of them. The children looked healthy and they were by all means cheerful. By the roadside, there was a wall about five meters high. Almost all the children climbed up on the wall, and walked along the highest part. Fate shall be tempted, and boys will be boys. After breakfast, I and Bernt were tired and fell asleep. We arrived to Kimpese after 250 kilometers, around 3 pm. We had dinner with Emy Meantizila, and after the meal, we did nothing but discuss all kinds of different projects. Emy, who is a pastor, was in charge of the translation of the Bible into Congolese, he takes care of street children and runs a school for them. He also runs an agricultural project that is the livelihood of 30 families, he is committed to the Gothia Sport Center in Kimpese and he runs a vocational school for construction workers and mechanics. He´s planning to implement Internet broadband for the households of Kimpese and to start fish breeding together with his son, Dinawa Diaku Emy, who recently finished his agronomist education. Emy is also a baker. He´d made all the bread we ate when we were in Kimpese. Bread that is moreish. The oven is not good at the moment, he said, but no doubt he´ll find a way to acquire better bakery equipment, other recipes to diversify his selections of bread and more challenges in life overall. Emy is a very interesting person. He has an enormous capacity and the ability to think out of the box. He especially raised two issues concerning the future of the Congo. The first issue was that the Congolese don´t fully appreciate the indispensability of having money. Many Congolese can manage without money today, and that´s why they don´t think it matters. My reflection is that money ought to be even more important for a Congolese than for people in rich welfare states. In the Congo, money can mean the difference between life and death when you get ill. If you can´t pay for medical treatment you don´t get any. The other issue of importance to the future of the Congo that Emy brought up is the Western world´s interference in and indirect rule of the Congolese politics. He says that the Western world even influences democratic elections. This practice needs to stop. In Kimpese, there was no electricity during our stay. The food was prepared on small charcoal stoves. One of them used to be a car wheel rim, but was now filled with charcoal with a pot upon it. The night is pitch-dark after 6 pm. Our hosts had bought amazing Chinese lamps lit by LEDs and batteries. They give away quite a good light and you can carry them like a hurricane lamp, but the light isn´t good enough to read by for a longer time. My computer battery was empty by 8 pm, and shortly afterwards a bright person in the company suggested that we all go to bed. Everyone went along with the idea as this was our best option. Bonne nuit!